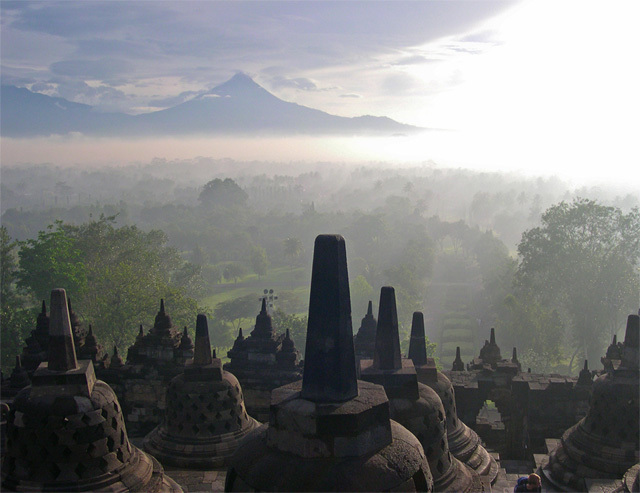 The Borobudur Temple in Indonesia is the largest Buddhist temple in the world and Indonesia’s most popular cultural heritage icon. The site is one of the world’s most treasured monuments and as such is a UNESCO World Heritage Site. The temple is situated on the island of Java, in Magelang, in the Kedu Plain, 40km from Yogyakarta, 53km from Surakarta and it lies in the shadow of two active volcanoes. It covers 123m² and features intricate and fascinating architecture and design elements. Much of the Gupta architectural design shows Indian and Hindu influences but there are also indigenous elements. There are 2,672 intricately carved, stone relief panels most of which feature scenes from Buddha’s life and tell the story of Buddhist cosmology. There are also 504 Buddha figures. The incredible thing about this structure is that no cement or mortar was used, instead the pieces of stone were fitted together like interlocking pieces of Lego. About 55,000 cubic meters of stone were used in the construction and they were joined together with knobs, indentations and dovetails. The site has been constructed as one giant stupa with a square base with 6 square lower platforms at the base and 3 circular platforms on the top. The structure has three ascending levels which are reached by following a path, corridors and stairways. This gradual ascension is symbolic of three levels in Buddhist – the world of desire; the world of form and the world of formlessness. The central dome is situated on a platform and surrounded by 72 perforated stupas which hold 72 statues of Buddha. These small stupas are bell shaped and the perforated openings form a decorative design. The ascending nature of the structure gives it a pyramid-like appearance based on earlier local punden berundak step pyramid structure. The temple was constructed in the 9th century during the Syailendra Dynasty, it took about 75 years to complete and remained in use until the 14th century. 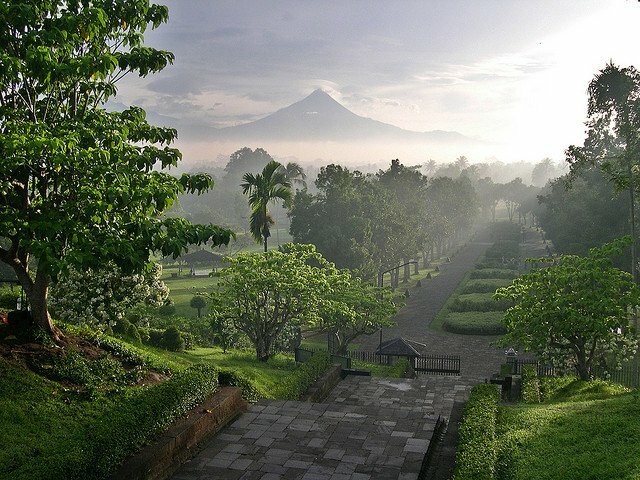 For several centuries the holy site was unused as it lay hidden under volcano ash and the overgrown vegetation. Until being rediscovered in 1814 by the island’s Governor-General Sir Thomas Stamford Raffles when the island was under British rule. Since then the monument has been restored and preserved. 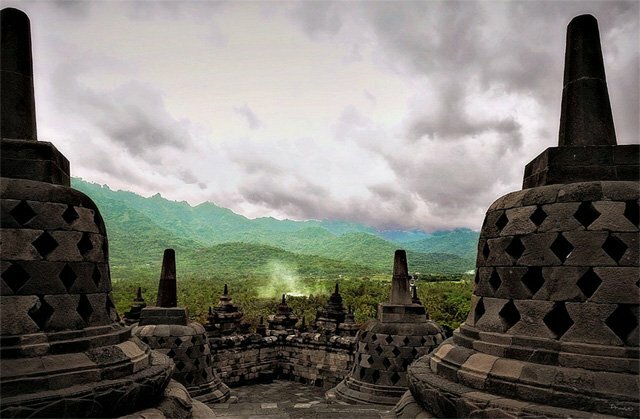 The annual Buddhist celebration of Vesak takes place here in May or June when Buddhist pilgrims make the journey to the temple during the full moon. 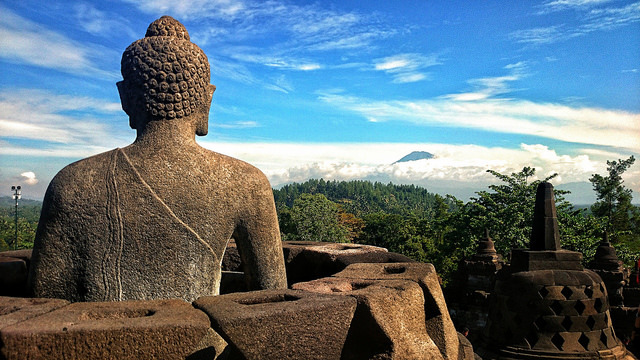 The pilgrimage involves walking between three Buddhist temples, Mendut, Pawon and finally Borobudur.